Learn the most important phrases and expressions in Hungarian! Do you want to express yourself in Hungarian? You can learn the most important sentences from this course! It will be easy to book a table in a traditional Hungarian restaurant! Have you ever wanted to learn Hungarian language but you didn't know where to start? Well, just start from our everyday phrases in Hungarian and then keep on studying Hungarian with Hungarian in 1 day and Hungarian: day 2 . We will teach you basic words and phrases in Hungarian, simple phrases in Hungarian and tourist phrases in Hungarian. After our course you will be able to have a basic Hungarian conversation with your native friends and ask for information. Thanks to our repetition system you will never forget what you learn beacuse our app reminds you when it's high time to revise to engrave in your memory each and every word you learnt. Do not forget to have a look to our images: connecting images to words is the key to remember new words e phrases. This course is made up of several simple phrases in Hungarian, common phrases in Hungarian and travel phrases in Hungarian. So, go through our course to become a real Hungarian speaker! Are you afraid of going to Hungary beacuse you think that, if you get lost, you will never find the way back to your hotel? Well, our course is here to make all your fears disappear in one second! Expression about time, space and asking information, everything is condensed in one super useful course. 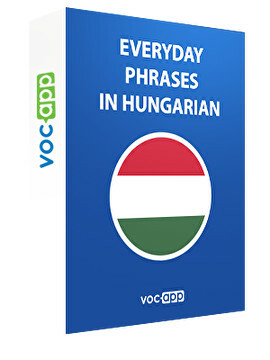 Learn basic Hungarian with VocApp and discover new content, even more interesting! Listen to the pronunciation and repeat because we created courses made up of basic phrases in hungarian with pronunciation, so that it will be easy for you to learn how to pronounce these words.